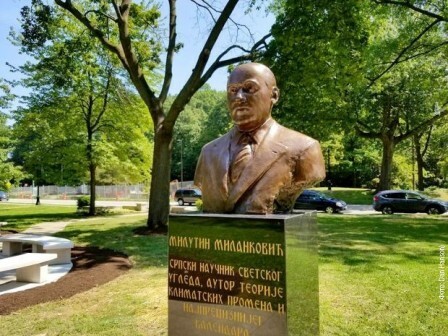 The bust of Milutin Milanković, a Serbian scientist, was unveiled at the Serbian Cultural Garden within Rockefeller Park in Cleveland, Ohio. The launching initiative for the placing of the bust was initiated by Aleks Maceski, Honorary Consul of the Republic of Serbia in Ohio in cooperation with the Directorate for Diaspora of the Ministry of Foreign Affairs of the Republic of Serbia. The bust of Milutin Milanković was done by academic sculptor Ivan Felker from Niš. The Serbian Cultural Garden in Cleveland, which exists since 2008, contains memorials of St. Sava, Petar Petrović Njegoš, King Peter I Karađorđević, Vuk Stefanović Karadžić, Stevan Mokranjac, Mihajlo Pupin, Nikola Tesla and Mileva Marić Einstein.